An example of good colour contrast in a washroom. In washrooms and shower stalls, use floor finishes made of non-slip, non-glare material. Floor tiles, whether ceramic, linoleum or vinyl composite, should have a matte finish to cut down on glare. Loose carpeting should be backed with a rubber-like material to prevent slippage. Avoid glossy finish on wall tiles, which may also produce glare. 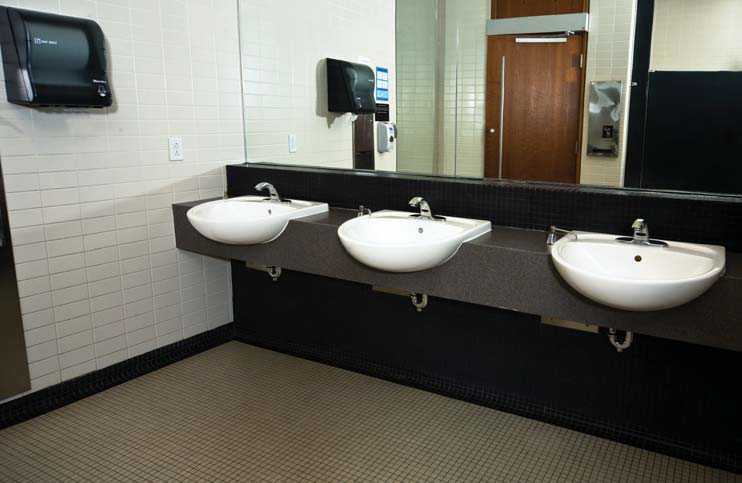 Use colour and brightness contrast to highlight toilet stalls or enclosures, accessories and fixtures in a public washroom or bathing facility. For example, plumbing fixtures should be colour/brightness contrasted to the walls and floors to prevent someone with blindness from accidentally bumping into them. Toilet paper dispensers, soap trays and light switches can be enhanced with borders that are colour/brightness contrasted to the surrounding surface. Other essential items like faucets, grab bars and towel rails should also contrast in colour and brightness to their background surfaces. Washroom accessories should be located logically in relation to washbasins and should not protrude into paths of travel. Wall-mounted accessories and equipment should not project out from the wall by more than 100 mm. Accessories that are normally placed at a high wall level, such as coat hooks, should be placed above head level, so that they are not a hazard to people impacted by blindness. If possible, towel dispensers, waste cans and drinking fountains should be recessed into the wall. Towel dispensers that use motion detectors are a good choice because they are universally accessible. Light fixtures should not be placed around a mirror, because this will create glare. Instead, arrange soft, diffuse lighting to illuminate the user’s face. Flush controls are ideally electronically or automatically activated. These controls should contrast in colour and brightness to their surrounding surface. Urinal centre lines should be identified by vertical piping or a tactile raised marker, directly above the urinal. This should be in colour and brightness contrast from the surrounding surface. Seats in shower stalls should be colour/brightness contrasted to their surroundings and detectable by people using a long cane. Shower heads should be colour/brightness contrasted to their background. Avoid designing curbs at shower stalls, which are a tripping hazard for everyone. If there are curbs, they should contrast in colour and brightness to the surrounding floor surface to reduce the possibility of tripping. In buildings where it’s possible to provide assistance, single user washrooms should be equipped with a colour-contrasted emergency call switch that activates an alarm.